Asking one day per week for six months of our volunteers is asking an incredible commitment and is part of the reason we allow individuals to serve in just one position at a time. With our new program, the live blue™ Service Initiative, volunteers who want to go the extra mile can sign up for flexible opportunities, or also take on a leadership role on top of their traditional position. October’s Volunteer of the Month is a live blue™ Service Leader in addition to being a leader amongst the Marine Mammals volunteers. Please join us in congratulating Meaghan Sorce, an incredible volunteer leader. 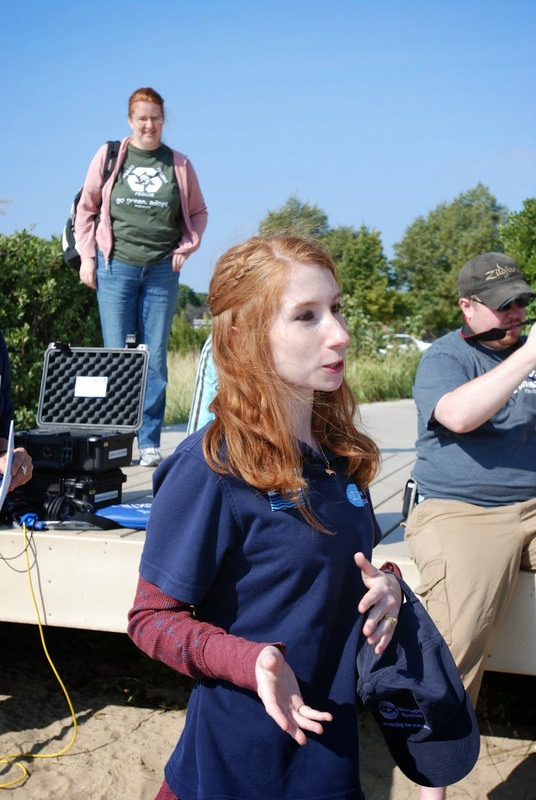 I, along with the other Marine Mammal Trainers, nominate Meaghan Sorce as September’s volunteer of the month. Even though Meaghan has been with our team for under a year she has taken the volunteer position to a whole new level. Her dedication, hard work, and reliability make her the perfect volunteer. Not only does Meaghan volunteer as a full day mammals volunteer she also spends her morning diving the fur seal exhibit going that extra mile to ensure the animal’s habitat is clean. She never complains regardless of what she is tasked to do and always has a smile on her face. The volunteers are expected to complete specific tasks throughout the day. We rely on them for the day to run smoothly. They help with diet preparation, vitamins, exhibit maintenance, enrichment, training sessions, cleaning and educational talks. Meaghan excels at all of these tasks, especially visitor interaction. She delivers wonderful public presentations, gearing her talk towards appropriate ages present. She spends quality time with guests answering questions and giving them details about the animals. Meaghan has an amazing attitude. She never complains and always does more than she is asked to. There is a list of extra tasks to be done if you have spare time. Every Friday Meaghan knocks at least half of those tasks off the list. She always volunteers to go out into the public area and talk during animal enrichment even if she is not assigned to. She will fill her day with tasks that truly benefit the animals, staff and guests at the aquarium. I cannot imagine a more deserving person for this honor. Join us in thanking Meaghan for her work with the mammals and with volunteers in the field! Learn more about how to sign up for the live blue™ Service Initiative.